Natural stone has been used as a flooring material for centuries all over the world. In addition to its timeless aestheticqualities, natural stone’s durability, low maintenance profile, and recyclability make it a sustainable flooring choice. This casestudy examines the benefits associated with the use of natural stone flooring in high traffic areas. Flooring materials show age differently and at different rates. Flooring options, such as vinyl composition tile, require frequent refinishing and lose surface quality relatively quickly. In contrast, natural stone flooring ages gracefully and can last for centuries, as many historic examples illustrate. While some estimates indicate a 50-year lifetime for flooring, the National Association of Home Builders expect natural stone, particularly granite, marble, and slate, to last approximately 100 years with proper maintenance. Table 1. Average energy and water consumed during the quarrying and processing of natural stone products. *Values are reported per net ton of stone extracted (for quarry operations) and produced (for processing operations). ∞Data was not provided in the report due to insufficient response from the sandstone industry. Natural stone, unlike vinyl flooring, coated concrete, or ceramic tile, has continuous color and structure throughout. This integral finish reduces visibility of surface scratches or damage. Materials with integral finishes are easily repairable and thus enjoy a significantly longer life than surface finished materials. Coupled with its durability, this characteristic translates to a low maintenance and repair profile for the product. Nevertheless, natural stone laid in high traffic areas will eventually dull due to foot traffic and dirt. However, stone floors need only be swept or vacuumed on a regular basis to remove the abrasive factors that cause dulling. It is advisable to employ entry mats to prevent abrasive particles from entering the building. Stone floors can also be cleaned more thoroughly with chemical solutions as necessary; contact your stone supplier for an appropriate product. Such a simple maintenance routine will substantially delay the need for polishing in situations requiring high-gloss finishes. Relatively high material and installation costs for stone flooring may deter some designers from further considering the material. However, because of its enduring useful life and little need for extensive maintenance, natural stone is economically advantageous. A life-cycle cost (LCC) study commissioned by the Tile Council of North America calculated that although high-quality stone, namely marble and Turkish travertine, has installation costs of $21/ft2 and $12.50/ft2, respectively (as opposed to under $10/ft2 for most other products), their annual expenses are less than those for some competing materials. In fact, expenses for sheet vinyl and vinyl composition tile (VCT) are more than double those for travertine or marble.6 The results of the TCNA investigation are presented in Table 2. Table 2. Results of a life-cycle cost study of various flooring materials commissioned by the Tile Council of North America. Table 2 illustrates that stone is indeed more affordable over its expected lifetime than comparable materials. Considering the economic and physical benefits of stone flooring, this material is an excellent choice for high traffic areas. Yet, the positive attributes of natural stone does not end here. In fact, a third advantage to natural stone exists: preservation of indoor air quality. Volatile organic compounds that source from flooring are associated less frequently with the flooring material itself than with the products used in manufacture, installation, and maintenance or refurbishment. Such products include adhesives, like those applied to carpet padding and tile, as well as chemical finishes, such as polyurethane for hardwood. Binders commonly used in the production of carpet also emit VOC’s, and even with regular cleaning, carpet harbors particulates that may be allergens or may carry bacteria. The use of natural stone can avoid both particulate aggregation and VOC generation. 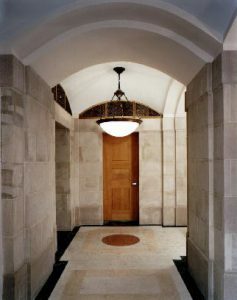 Dust and allergens are unable to build up on the surface of stone, particularly when a routine cleaning schedule is followed; the relatively small surface area on a sealed stone floor prohibits this process. Cleaning can be accomplished with a gentle (non-acidic) soap and water solution. Further, natural stone surface treatments require only abrasion (as opposed to chemical polishing compounds) to achieve a glossy finish, and stone itself contains no VOC’s. Even the mortar and grout needed to anchor stone do not diminish indoor air quality. Stone sealant, which is conventionally VOC-rich, is almost always necessary for protection against stains and scratches, but low-VOC options are now available. Natural stone has a number of advantages over alternative flooring materials. Maintenance is minimal as well as cost-effective, and stone’s longevity allows it to be salvaged and reused time and again. Most importantly, natural stone flooring does not contribute to poor indoor air quality if low-VOC sealants are utilized. These attributes make natural stone a sensible choice for flooring in high traffic areas. Rabin, Emily. “Durability: A Key Component of Green Building”. Environmental Building News. November 2005. https://www.greenbiz.com/news/2005/12/18/durability-key-component-green-building. National Association of Home Builders. 2007. Study of Life Expectancy of Home Components. Natural Stone Council. Granite Dimensional Stone Quarrying and Processing: A Life-Cycle Inventory. August 2008. Center for Clean Products. University of Tennessee. http://isse.utk.edu/ccp/projects/naturalstone/results_pubs.html. Natural Stone Council. Limestone Dimensional Stone Quarrying and Processing: A Life-Cycle Inventory. August 2008. Center for Clean Products. University of Tennessee. http://isse.utk.edu/ccp/projects/naturalstone/results_pubs.html. Natural Stone Council. Sandstone Dimensional Stone Quarrying and Processing: A Life-Cycle Inventory. August 2008. Center for Clean Products. University of Tennessee. http://isse.utk.edu/ccp/projects/naturalstone/results_pubs.html. Tile Council of North America (TCNA). Floor Coverings Comparison. 2006. Environmental Protection Agency. 25 November 2008. “An Introduction to Indoor Air Quality”. Accessed 9 December 2008. https://www.epa.gov/indoor-air-quality-iaq. Photo by WorthGroup of Englewood Colorado. 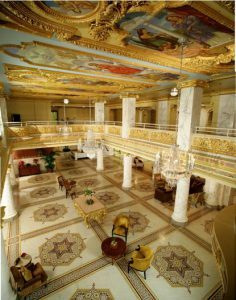 Originally operating in the 1890-1910 era, the French Lick Resort aimed to capture the historic ambiance of that period for their 2006 grand re-opening. The timeless aesthetics and unique durability of stone flooring provide just that. Photo by Brian Hutson/Hutson Creative. Courtesy of Stone World magazine. Black and white marble flooring was custom-cut during 2006 renovations of this 1914 building to mimic the appearance of the original bank. Located in a main corridor, this flooring continues to uphold its beauty and integrity despite the daily traffic. Photo by Shepley Bulfinch Richardson and Abbot (SBRA) of Boston, MA. Courtesy of Stone World Magazine. The Northwest Corridor design at Boston Public Library serves as a bridge between the historic architecture of Charles Follen McKim and a 1972 addition by Philip Johnson. 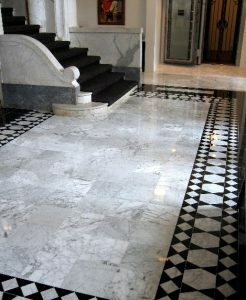 Several varieties of marble were employed for the flooring in this area of the library.